We provide reliable accounting outsourcing services such as Bookkeeping, Accounts production, payroll and tax related services for UK Accounting, Chartered Accountants and Chartered Certified Accountants, CPA firms from low cost regions India and Nepal. At AccountsAid Accounting Outsourcing, each team has dedicated manager with proper training by someone studied, trained and worked in the UK with professional ability who understands well the need of practice firm. We offer flexible services varying from piece meal to complete back office outsourcing for accountants firms. Our services are Annual accounts, Bookkeeping, Management accounts, Taxation(Individual and company), Payroll, VAT returns, company secretarial, Filing to HMRC/CH etc. We are sensitive towards handling third party information and aware of data protection and confidentiality. We can adapt different working arrangement according to your needs and organizational structure. We are proficient and well-trained at using the mostly used software available in the practice market including online software version from different vendors. Reduce cost/overhead/investment by up to 65% and increase efficiency, competitiveness, quality and customer satisfaction with AccountsAid’s accountancy outsourcing services. AccountsAid is run by professionals experienced in accounting services outsourcing for several years after having trained and worked in the UK. Our colleagues are fully aware of data protection act in the UK, EU GDPR and no disclosure policy. We are specialized in UK accounting practice to deliver excellent service with keen in skill and up to date knowledge. AccountsAid’s key players are members of Recognized Supervisory Body (RSB) who you can trust to handle sensitive information. 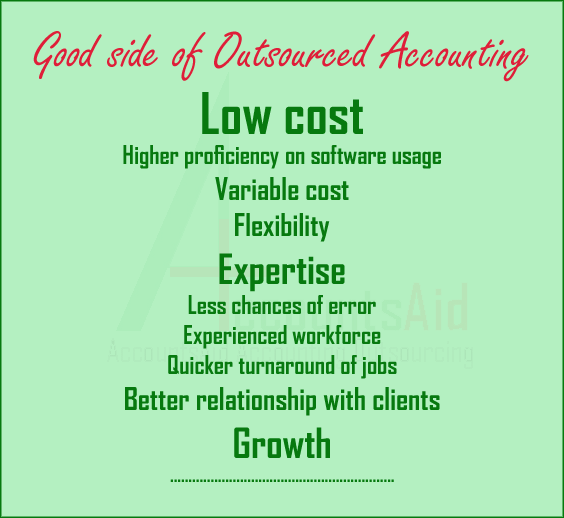 Colleagues at AccountsAid Accounting Outsourcing Services have ability to work on all mostly used bookkeeping, accounts production, tax etc software. Please click ‘Get started’ button below to contact us for prompt reply. We have experienced VAT staffs that can relieve you from compliance burden providing a comprehensive and confidential services. If you are not passionate working some of the accounting/bookkeeping work in house, you may outsource to us in low price. #AccountsAid offers complete back office of #firm of #accountants for monthly fixed fees which enables you to focus on client relationship.